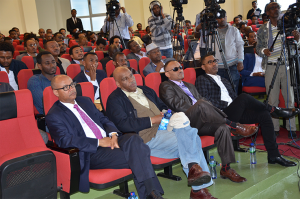 The Center for Federalism and Governance Studies of Addis Ababa University organized public dialogue on how to manage current political transition in Ethiopia on Saturday, August 11, 2018 at Eshtu Cholle Hall. High profile personalities of the university staffs, intellectuals from different corner of the country and activists including Jawar Mohamed, Chief Executive Director of Oromo Media Network (OMN) have discussed on challenges and opportunities in the current political transition underway in the country and the way forward during the event. Addressing the gathering Dr. Zemelak Ayitenew, Center for Federalism and Governance Studies Director at AAU, said that the dialogue provides a platform to share experiences, discuss key strategies towards strengthening existing processes as well as identifying challenges and opportunities. “Intellectuals should play their role to ensure inclusiveness of recent reforms and to sustain the momentum of political transition in Ethiopia,” the director underscored. Jawar Mohammed, Director of OMN, on his part explaining the role of intellectuals, said that scholars should provide constructive critics to further boost up democratization process. Promising results have achieved that would facilitate better condition for democratization. Opposition political parties are invited for peaceful involvement in the political life of the country, which is remarkable change, said Jawar in statement. Building institutional democracy and sharing a common vision in building nations is not optional to sustain the reform,” he added. The event featured question and answer session.